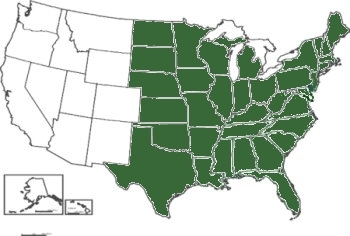 Plant height: 3 - 8"
Misc. 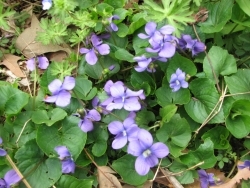 Viola sororia is the stateflower of New Jersey, Wisconsin, Illinois and Rhode Island. 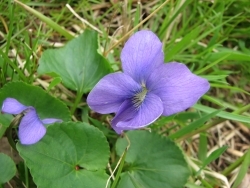 The young leaves and flowers are edible. This plant also has cleistogamous flowers, self-pollinating. Caterpillars of several Fritillary butterflies feed on the foliage: Speyeria diane (Diana), Euptoieta claudia (Variegated Fritillary), Speyeria aphrodite (Aphrodite Fritillary), Boloria bellona (Meadow Fritillary), and Boloria selene myrina (Silver-Border Fritillary). The seeds have elaiosomes that attract ants. Mourning dove, wild turkey, and bobwhite eat the seeds.